Boston Rock Archives: Milkwood - How's the Weather? I will be uploading rare, out of print and/or hard to find music that came from Boston and it's surrounding towns. I will also post links if I find them from other blog pages. If you are in one of these bands and would like me to take down the links, I will do so. I'm not trying to screw anyone over, just trying to get good music out to good people. Milkwood - How's the Weather? 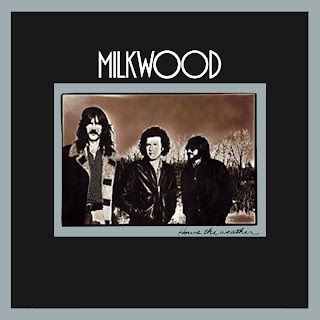 In the early 1970's, the two future Cars lead singers, Ric Ocasek and Benjamin Orr, were members of a Boston folk trio called Milkwood. At that time, the two went by their real names, Richard Otcasek and Benjamin Orzechowski. Jas Goodkind rounded out the guitar-and-vocal trio, but future Cars keyboardist Greg Hawkes also played on Milkwood's only album (his name was spelled "Hawks" in the credits), providing sax and horn arrangements. The 1973 album was called How's The Weather, although some mistakenly think it was self-titled. It predates the first Cars album by a good five years.